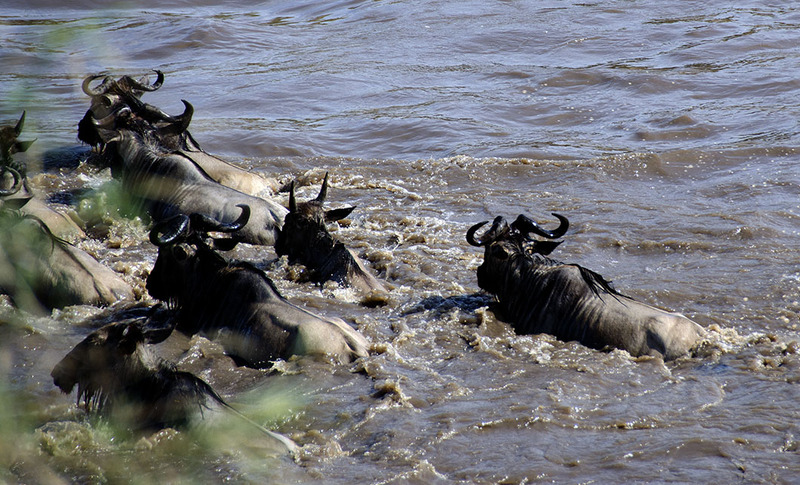 We very nearly missed the river crossings we had come to the Serengeti to witness. Rains arrived early this year. And the wildebeest herds, following some primal genetic coding that propels them on an arduous trek across the Savannah in search of fresh new grass, had already moved to the Northern plains. Perhaps even crossed over to the Masai Mara. The worry was that they would be well on their return journey into Southern Serengeti by the time we reached the North. 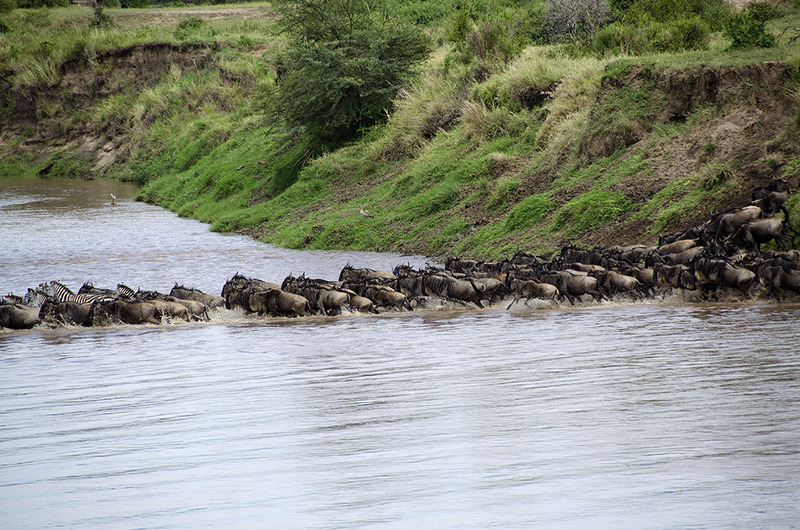 Some people mistakenly assume – or are led to believe – that the cross border migration of wildebeest is a seasonal occurence exclusive to the Masai Mara in Kenya between July to September. 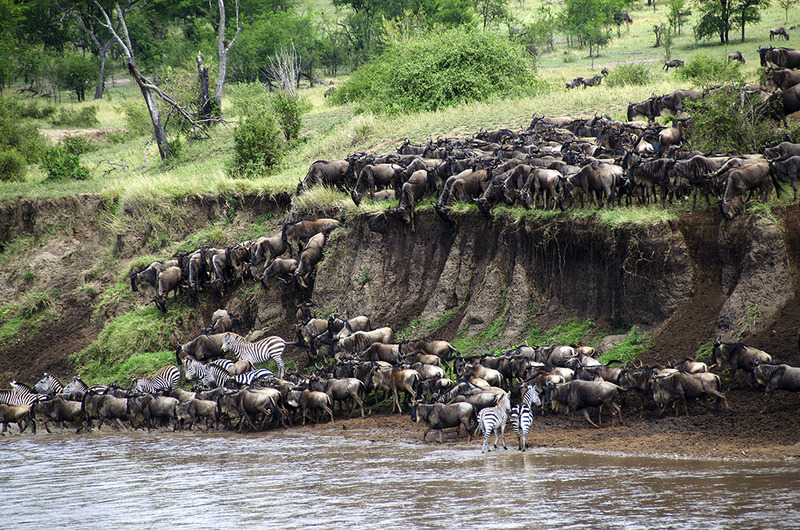 In actual fact the great migration is a year round phenomenon in which over two million herbivores – around one and a half million wildebeest, along with zebra and gazelles numbering nearly six hundred thousand – follow the rain collectively, in an 1800 mile long clockwise loop. And the bulk of this ‘greatest mammalian movement on earth’ takes place in the Serengeti in Tanzania. 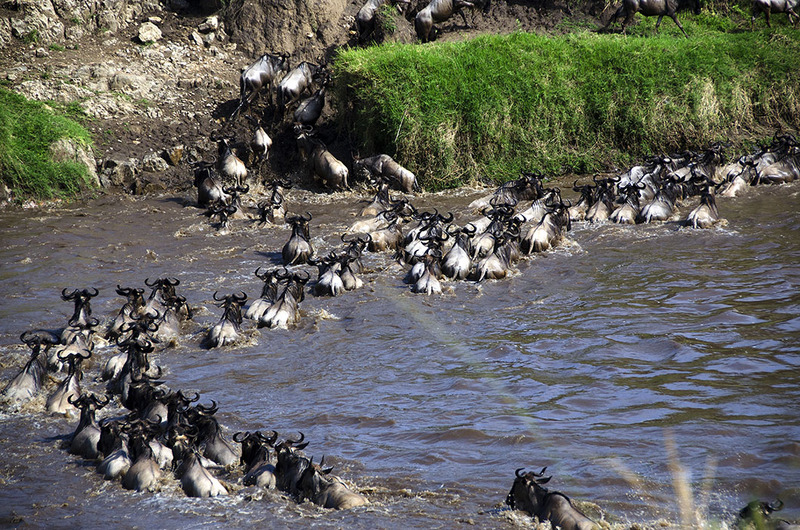 It is therefore technically possible to catch the migrating herds at any time of the year at a corresponding location. 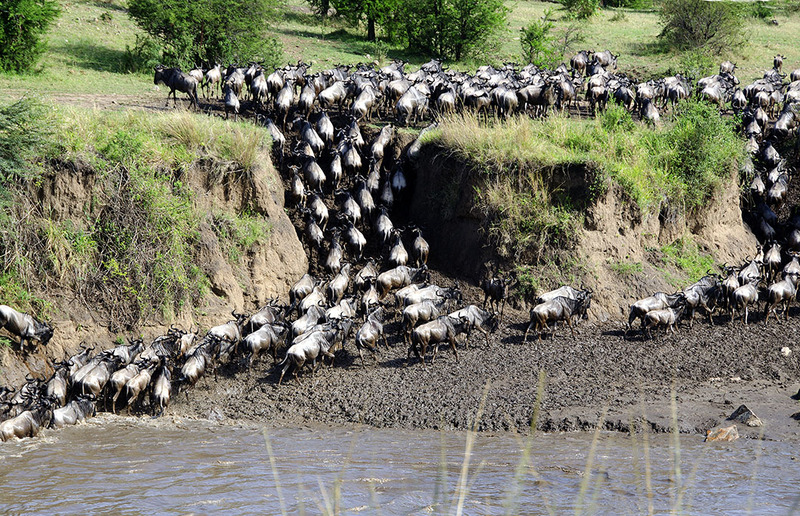 Roughly based on their movements in preceding years: Jan – Feb in the Southern plains for synchronised calving, Mar – May heading North along the Western corridor, June to early July along the Grumeti river, July – August around the Mara river and plains, Aug to Oct in Kogatende in the North as well as across the border in Masai Mara. Then back again to the South along Seronera in Central Serengeti to repeat the sequence all over again, like they have been doing for God knows how long! One million year old fossil finds prove their seasonal presence in the Olduvai Gorge (where the Leakey’s researched the origin of man). Scientific mapping of herds only began in the late fifties, thanks to the efforts of Bernhard Grzimek (whose book; “the Serengeti shall not die”, was instrumental in the creation of the Serengeti National Park) and his young son Michael Grzimek. The latter died in a plane crash during the process and is buried in Ngorongoro. An accurate pattern of movement is naturally impossible to predict, and is hugely dependent on the rain Gods playing by the rules.When they don’t, well, you keep your fingers crossed and hope for the best. We did just that. And managed to catch one tail end crossing across the Kogatende river on our first day in the North, and three in a row on the second! If we had only arrived a couple of weeks earlier we would have witnessed giant herds crossing incessantly for hours. We were told we could have gone back to our lodge for lunch and returned to find them still crossing! That would have been some spectacle! But as it was, what we did get to see was pretty special. Bravo! All across without incident, and none ended up as croc fodder! Our most dramatic encounter however – a National Geographic experience, George (our guide/driver) called it – was a wildebeest road crossing earlier in the safari in Central Serengeti. Rain in the distance and a few stalking lions behind, triggered the massing (herding) of a large splinter group that George figured was headed in our direction. So we retreated further back allowing them space. Not all drivers were as sensitive however, and we were dumbfounded by a couple of vehicles that drove right into the midst of the agitated group. After several false starts it took one plucky gnu to set hundreds of hooves thundering straight past us in a humongous cloud of dust, and galloping off into the promisingly dark horizon. It was George’s foresight and sensitivity that afforded us this ringside view of one of the most exciting spectacles we have ever witnessed. Thank you George! As the last of the wildebeest rushed across, George turned around and let out a cry. 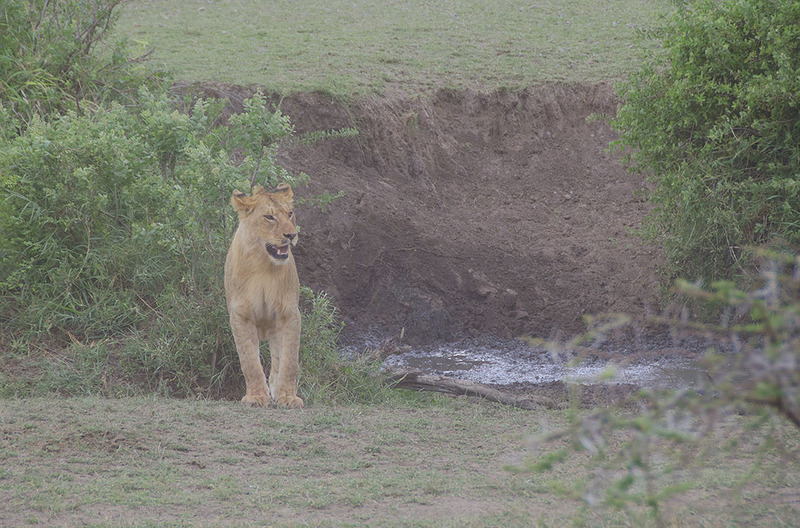 Peering through the haze right behind us, with a comical “What just happened?” expression on his face was this bewildered lion…….part of the same pride that was foiled by another ungulate herd the day before. An aside for the word lovers and etymology nerds amongst you: It is assumed (among other interpretations) that the call of the wildebeest (‘wild cattle’ in Dutch for lack of a better name for this strange animal at the time.) is the source of the name Gnu. But were you aware that the collective noun is “an implausibility of Gnus“? National Geographic Experience indeed!!! Spectacular and crazy good! One of the best blog shares of nature experience I’ve read. Very enviable. Rommel, that’s a wonderful compliment! Thank you very much. What an amazing experience and such fantastic photos! 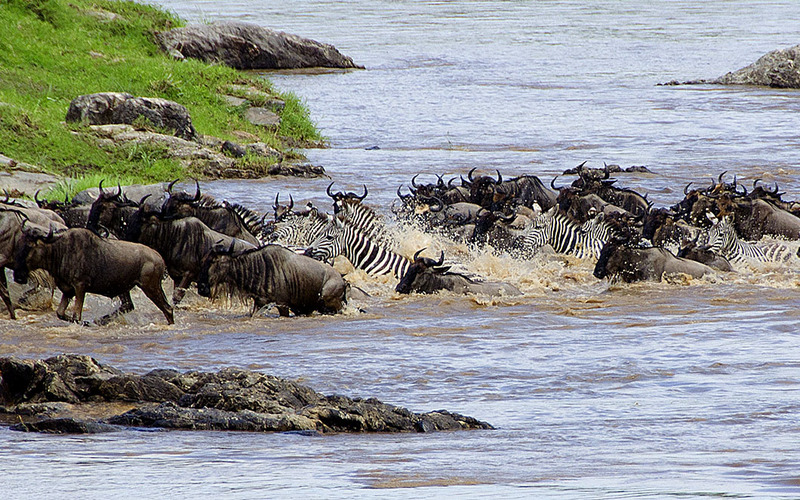 We were in the Serengeti just before the river crossing and thousands of wildebeest and zebra were all grouped together a few miles from the river but we unfortunately didn’t get to see the actual river crossing. I still loved every second of it though. Fab post! Thank you very much Ayla. The river crossings can be a bit dicey to time. We were lucky to catch the tail end. 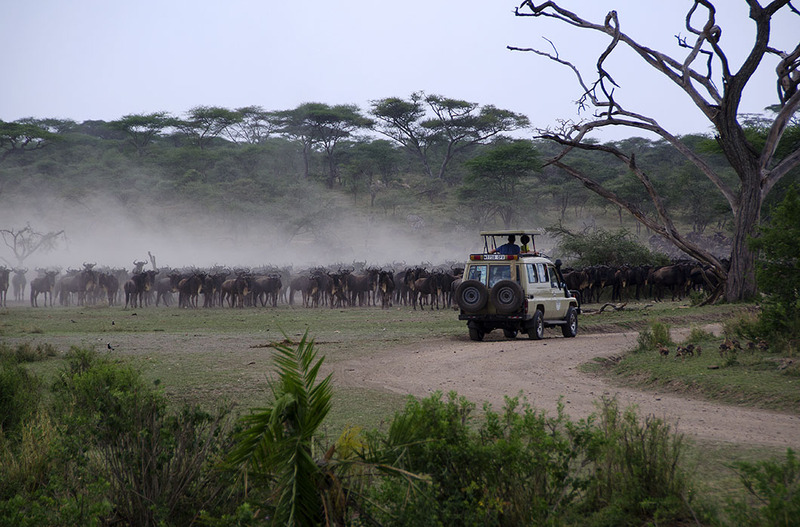 I agree with you that a drive through the Serengeti is amazing even without these extras. Thanks so much for amazing photos and riveting storytelling. The photo of the lion is the icing on the cake! Wow! 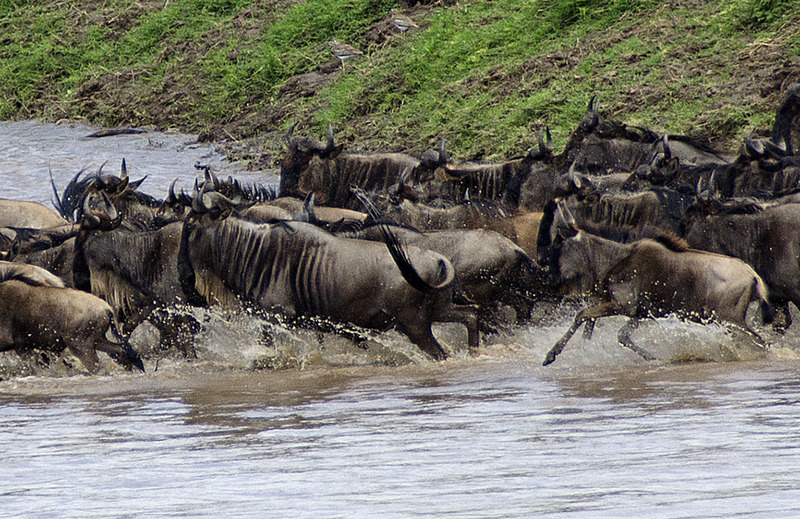 The wildebeest herd is fast! It looks scary in the video. Can’t imagine how thrilling it must have been to witness it up close! Oh it was exceptionally thrilling Kasturika! Not least because we weren’t expecting it, unlike the river crossings. What an amazing sight! And thanks for your fact at the end. I didn’t know. I’ve more than once wasted time thinking up collective nouns for ‘travel bloggers’. 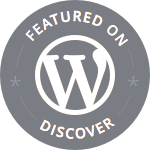 …an implausibility of travel bloggers…. no, still not quite right…. Amazing experience to witness the migration! I saw it several times in NG channel and I just I wished I were there! Great shots Madhu!! Hi Madhu. No new posts this year? Everything OK? These are all NatGeo caliber shots, Madhu! But, I must admit, the bewildered lion is my favorite. What an unbelievably amazing experience and your wording puts such a mystical spin to it all. Happy New Year, wishing you all the best. Mine as well! We all laughed out loud at that look on his face 🙂 Thank you Tahira. All best wishes for the new year to you too. Wow wow. Would love to see this. I so want to go back to Africa. Maybe next year. Africa gets under your skin doesn’t it? We are already dreaming of a return 🙂 Thank you for reading Alison.